The Stable is born out of a love for local produce and the community in which their various restaurants reside. Established in 2009 by Richard and Nicki Cooper in Bridport, their vision was, and remains, to create wonderful unique environments for people to sit, relax and enjoy the best of local produce at a reasonable price. This means that cider, a natural focus beverage for a business which began in the South West, is supplied by small scale producers, and all the meat and fish you will enjoy at their restaurants will be sourced from no more than a 10 mile radius of their restaurants. It’s a great honour therefore, that they have chosen to feature our award winning, traditionally cured bacon for their delicious Denhay Delight pizza, a real British pizza made with their sourdough base (somewhat flying against the preconceived norm of a traditional Italian pizza base). As The Stable grows across the South West their approach and ethos for each restaurant remains unchanged, provision of fine food and crafted cider in alluring, enchanting and unique surroundings. Grounded with its local community forefront in their minds, The Stable continues to win the hearts and praises of its many customers. 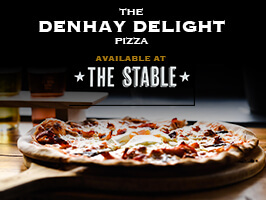 The Denhay Delight is a wonderful pizza featuring our award winning dry cured bacon alongside field mushrooms, a rich tomato sauce and mozzarella, finished with a free range egg. Available at almost all of their 17 restaurants across the south of England, you really must sample the Denhay Delight. Definitely a pizza to savour and leave you wanting more.